I enjoy hunting. Hunting for images, that is. The excitement of the chase, pursuing a sometimes-elusive prey, the satisfaction of a job well done. And the occasional experience of coming up short; that, too, happens while hunting for images. Unlike hunting for game, the pursuit of the fine photographic image always results in the revelation of an entirely new species. Or variations within species. For no two photographs are the same, even when the genre and subject matter are most familiar. That is part of the surprise. 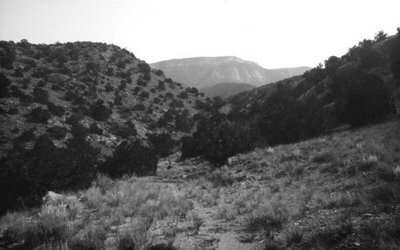 Today I loaded my falling plate pinhole camera with eight large-format film plates, and went hunting in the northern foothills of the Sandia Mountains, near the village of Placitas. Armed with tripod-mounted box camera and backpack, I was unaware of the particulars of what I would come across during my hike, but was hopeful that, with an attentive, open eye, quiet yet watchful, I could take advantage of every opportunity presented to me. What interests me at times like this is how preparation meets opportunity. When one is intimately familiar with the materials of one's craft, having worked through the difficulties and struggles peculiar to a genre or field, it soon becomes second nature to tackle the technical aspects of the task at hand, allowing a deeper attentiveness to be placed on the raw truth of what one is confronted with. In this case, how best to represent the clear, thin air of the high desert climate of New Mexico's mountains in all its rugged beauty, and not come away feeling that only cliché or sameness had been the end result. One hillside of juniper and pinon pretty much looks like another; what excites me are particular uniquenesses one happens across, fashioned from a juxtaposition of form, perspective and light. These ancient hills seem ever so timeless and permanent, yet the details one happens across speaks to the transient and temporal, the ever-present process of change, death and renewal. A tree grows from seed, matures, and then dies, becoming driftwood in some flash flood ridden canyon. Eventually the organic materials making up this once living thing return to the landscape, to once more enrichen and nurture a new tree's growth. And the cycle continues. And I feel at times like I, too, am participating in a cycle of recreative birth. I find myself loading up the same camera, driving out to perhaps the same areas, lugging the awkward equipment up and down hills that look for all the world like all the others I've hiked up and down; went through the same setup procedure for making an exposure as I've done time and time again, only to heft the tripod back onto my shoulder and trudge on a bit further. Yet the results from these cyclic workings are new, fresh, alive. Sure, some of it succeeds in certain measurable ways better than others; but what remains unmistakable is that constant miracle of having captured permanently on film a place and a moment in time of my choosing. Happenstance and the ephemeral intersect with a structured methodology of visual selection to create a photographic reality representative of the uniqueness of who I am at that time and place. These aren't just pictures of the mountains; they're pictures resulting from me having been to the mountains, hunting for pictures. 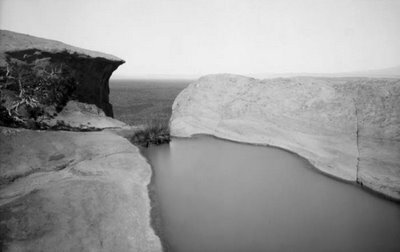 I've found myself lately engaged in landscape photography of the American Southwest, using a large format pinhole box camera, loaded not with sheet film, but orthochromatic paper negatives. Just ask any conventional large format photographer: pinholes and paper negatives are the playthings of grade school kids just being introduced to the medium; as a teaching aid but nothing more. One becomes a bit self-conscious here, knowing that these words are indeed public, forever to be memorialized in the archives of some nameless server farm, situated who knows where. What I am carefully tap-dancing around is the confession that I'm really not all that good at photography, at least in the conventional sense. I find myself, through lack of discipline or just plain bone headedness, unable to execute the technical perfection required by my vision. Take, for example, large format sheet film. I've yet to process a negative completely devoid of scratch or dust fleck, yet I read all the time where most others are able to do this seemingly simple task with little effort. I can use the excuse that I've worked in obscurity for years, have never taken a real workshop, save for an introductory course in the basics, years ago. I've been a loner, isolated from the mainstream: that's my excuse. And as with most people who've worked in isolation, I've developed my own peculiar working methods and choice of materials. Once I became obsessively involved in pinhole photography, the strength of the obsession drove me foreword through the difficulties of working with nonstandard materials, to the point where I began to understand how to use these materials in certain specific lighting conditions, to achieve consistent, predictable results. Once this began to happen, pinhole became, not a gimmick or mere curiosity, but a tool to be exploited to achieve specific results. I'm still not certain if this reliance upon arcane and obtuse materials and methods is a crutch, an excuse, based on earlier failings to master that which others before me have found so satisfying, or whether this chosen path is indeed an open-ended venture of unlimited creative possibilities. I've begun to suspect it's the later, but I'm having too much fun to really bother with worrying about it. I suppose I've come to the realization that what we now know as the conventional and mainstream in any creative field was, prior to being conventionalized, a highly personal, unique creative exploration into the unknown of endless possibilities. I can dredge up a few examples, most noticeable being the work of A. Adams, who developed a systematic methodology which future adherents came to call the Zone System, in which a photographer previsualized a finished print prior to ever exposing a sheet of film; predetermined his exposure and film developing technique based on the scene's brightness range and his personal vision, and then applied these decisions in a highly structured, precalibrated fashion so as to eliminate as much as possible the inclusion of accident from the process. There's now an entire school of adherents to these principles in the field of large format photography, as well as several alternative interpretations. What surprises me is the implication by some that, prior to Adams' methodology, the world didn't know how to properly expose and print photographs, as if he somehow were responsible for the invention of sensitometry. Which is nonsense; Adam's contribution was the systemization of certain scientific principles into a methodology that he could apply to his personal vision. The importance of Adams is the work that resulted. The fact that many others after him chose to replicate and pursue his working process, almost as a talisman, is to ignore the importance of what he personally achieved with that process. The importance I place on Adams is that he applied certain principles and practices to solve specific problems related to fulfilling his personal vision. He didn't worry about following the methods of his forbearers, but followed the needs of his personal vision. We can argue about the merits of his vision; what's indisputable is that his pursuit of technical perfection served that vision. I've lately again taken up the landscape image, using ortho paper in pinhole cameras, after jumping around to various other projects: dioramas, still-lifes, architectural, etc. 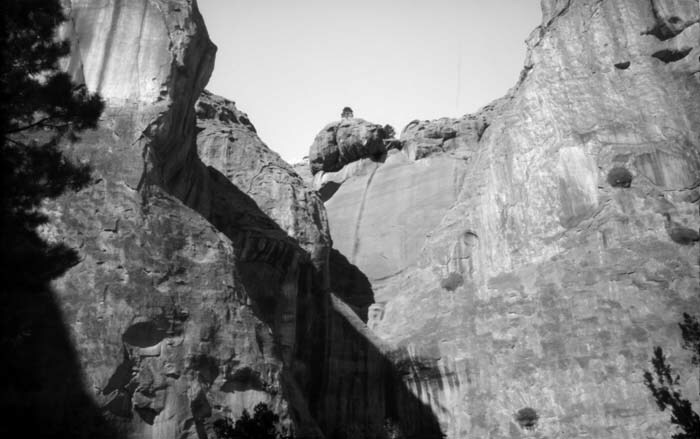 I walk into some visitors center at a regional National Monument and find displays of old photographs from a hundred years ago, and find that what fascinates me about these photos is not so much the subject matter but the fact that they were obviously captured on orthochromatic film, in large format box cameras. The sky has that distinctive washed out whiteness, devoid of high contrast clouds against the darkened sky; skin tones of Native Americans appear almost Negroid in tone, because of the ortho media's lack of sensitivity to red. And the fact that these old negatives could be blown up to poster-size without degrading into a mass of granularity is testimony to the size of the original negative. I have not consciously attempted to follow in the footsteps of the early landscape photographers of the west, nor do I even pretend to be mimicking them; nevertheless, I am fascinated that my own personal curiosity to see what things look like when captured on paper via a pinhole lens would somehow end up resembling, to some degree at least, photographs made in the same areas a century earlier. My methods and materials are much different from theirs; my choices are based on personal preference while theirs was not of choice but necessity. Mine is a mere reenactment, a retracing of those who have gone before me. In that sense, it becomes obvious through my images of the American Southwest that I am capturing evidence of a wilderness that no longer exists. Oh sure, if one were to find oneself stranded in the middle of nowhere, with a broken down vehicle and out of cell phone range, one would soon discover that the wilderness still exists, in at least the physical sense of the word. But we have lost the sense of wilderness as the great-unknown embodiment of the unfathomable. We no longer believe in wilderness; we have come to find ourselves the dominant species over the planet, and now have come to believe that we have conquered all, both inner and outer space. Meanwhile, it seems that a composite snapshot of the species' behavior would reveal that wilderness is alive and well in the heart of man, inasmuch as man continues to display a level of brutality and cruelty that rivals, perhaps surpassing, that of the natural world itself. So I have come to find that my landscape images refer obliquely to an inner landscape, as well; and that it is at least as wild and untamed as any the early explorers ever had to encounter. I may happen across a viewpoint or scene that may symbolize a sense of wildness, yet there remains a knowing that true wilderness has been subjugated to the needs of civilization. This last weekend I clambered over and around the National Monument known as Inscription Rock, in western New Mexico. Knowing that centuries of adventurers, explorers, settlers and travelers of all ilk’s had happened across this hulking outcropping of rock and inscribed in stone evidence of their having been there, I was startled most by the realization that our civilization was the one that fenced and corralled this symbol of man overcoming the wilds, by distilling the essence of what this rock meant to generations past into a petting zoo, a theme park, a carnival ride experience. One no longer happens across Inscription Rock in the midst of some monumental journey; rather, one places a visit, as one would to an ailing relative in convalescence, fenced in, programmed and controlled. Graven images. At times I think about this idea: is the act of creating photographs essentially an act of idolatry? Of course, I am somewhat purposely taking this, the 2nd Commandment in Judeo-Christian tradition, out of context, for the text goes on to refer to the act of idolatry as bowing down to worship (i.e. "serve") such a graven image. And most folks I know simply don't 'worship' photographs, at least not in the traditional sense of the word. I think what interests me here is the place that imagery and image making has taken up in our culture. Stepping back for the moment from the detritus of popular culture, it would seem to present enormous shock to a visitor from the third millennium BC, such as Moses, who lived a rather simple Sephardic lifestyle by our standards, to step into a large chain bookstore and saunter by the periodicals, or to place a visit to the home of Joe Average American and witness the central role that the television ("home entertainment center" in contemporary parlance) plays within the life of most families. Buddhists have their home shrines, paying homage to their ancestors; Hispanic Catholics have their ritablos, their home alters to the Saints and the Virgin. And yet the role that image reproduction machinery plays in the life of most people is essentially the same: an elevated place of central prominence, both positionally and chronologically. Taking liberties with metaphors, we can therefore avow that the act of making entirely new images out of nothingness is essentially an act of divine creation. Or at least places the artist in the position of participating in such a divine act. Artists and photographers engaged in image making are therefore to be seen as members of a priestly order, endowed with that special privilege enabling them to enter within the 'Holy of Holies' and commune with the Eternal Muse. Of course, this is all just speculative presumption, mere symbolic liberty taking. In the book "Copies in Seconds, Chester Carlson and the Birth of the Xerox Machine", David Owen explores the history of technology from the perspective of 'copy-making'. This is close enough to image making to warrant our attention. Hand scribing was the method used for millennia to reproduce (make images of) other text, until the arrival of Guttenberg's invention of endlessly replicatable movable type printing, which stayed at the zenith of copy-making until lithography was accidentally discovered by another German, Alois Senefelder, a mere two decades before Niepce and Daguerre's near simultaneous invention of photographic image making. Whereas scribal copying and mechanical reproduction of text may be seen as intellectual idolatry (i.e. the copying of thoughts and ideas), the arrival of photography was so original as to be proclaimed 'the pencil of nature'. Here was an invention that could, finally, achieve the idolater's dream of making graven images of the very created world forbidden of by Mosaic Law. David Owen goes on to describe culture itself as a form of copy making: the copying of social behaviors en masse, in an endlessly iterative fashion. In actual practice, the roles played by imagery in modern culture vary widely from such a narrow definition implicit in the term 'idolatry'. Yet one can't help but notice imagery's prominence in the public arena, which here refers to not only physically public venues, but the virtually public as well. So common are visual imagery that it can be likened to a form of neo-hieroglyphic symbolic language. Pictures now seem to take the place of more descriptive, sophisticated textual usage models, seen in earlier cultures. No more important of an example of this can be seen than that of the introduction of the 'Graphical User Interface', or GUI, upon the release of the first Apple Macintosh personal computer to the public. For the first time in post-Renaissance history graphic iconography seems to be replacing the more abstract algebraic terminology of symbolic logic. Counter-intuitively, this so-called 'advancement' in computing technology more closely resembles Egyptian hieroglyphics, or the medieval European religious icon, than it does the pre-GUI technology of the 1960s, for instance, that saw man step foot on the moon's surface. One clearly has to consciously wonder whether our culture is progressively evolving, or entering a new, high-tech Dark Ages, where the Serfs of this neo-feudalism will be forced to revert to simplistic word-pictures, rather than the sophistication of written language. As a photographer, I do not question my participation in the contemporary phenomenon that is image making on a colossal scale. This is because my personal vision, and working methods, are geared towards the creation of image as hand-crafted relic, rather than mass-marketed visual symbology. My works are physically relevant objects, crafted in small batches by hand; images in silver salts deposited onto clay-coated papers, more the result of alchemy than mass media. Yes, I appropriate the technology of contemporary technical manufacturing - coating silver gelatin emulsions is a sophisticated science - but this appropriation serves to reinforce the role of the hand crafted over the mass produced. My dialog with the materials at hand is an exploration of how the miracle of light interacts with the raw stuff of this physical world. It is a spiritual quest, inasmuch as my interest seems to lie in exploring the boundary between the ephemeral and the physical, the transcendent and the mundane. Forcing the exquisitely complex phenomenon that is light itself to be constrained to the sieve that is the pinhole aperture reveals just as much about the nature of light as the subject under examination. My quest is interested in the moments between moments, which seem possible of capture only through the instrumentality of the camera obscura, whereby one can glimpse the shedding of that mortal coil. Sometimes, I find myself motivated to do a certain thing just because I can. Like the legendary response to "why climb a mountain", I find myself tackling certain challenges "just because they're there". Take, for instance, my continued interest in appropriating non-photographic technology for the cause of serving my DIY appetite. I've become entranced at times over the prospect of making truly breath-taking photographic images, using lenses whose original purpose was for something other than the pursuit of the visual arts. I started doing this years ago with a homemade lens, made from a credit card sized plastic fresnel magnifier, attached to the front of my Anniversary Speed Graphic using a cardboard lensboard. The Speed is a great camera for doing just this sort of thing, because of its one unique feature: the curtain shutter. Even though my particular camera is over 60 years old, the curtain shutter seems to still be in an adequate state of service. I've pretended that I am a mainstream Large Format photographer at times, driven by the perception that I own a Speed Graphic with a functioning lens/shutter, and a handful of film holders in various states of service. I've pursued the approach of capturing images onto 4"x5" sheet film, and understand many of the technicalities of the medium. However, I really have not found a comfort zone in that particular working methodology. First, my one lens/shutter, the Kodak Ektar 127mm, is a good lens for B/W, but it's an uncoated lens, meaning that it's not immune to flare and haze effects. Additionally, I've yet to master the nagging little defects that occur with handling LF sheet film: the dust particles and processing-related scratches that seem virtually inevitable. Contrast this with the deep satisfaction that I've achieved in the last few years in creative pursuits centered around the pinhole-formed image. In particular, I've found a way to work with certain non-standard photographic materials, specifically graded RC photo paper as a form of orthochromatic sheet film, that gives me a degree of control equivalent to sheet film, yet minus the process difficulties and inevitable defects and artifacts. Paper negatives, for me, are just a more forgiving medium. Last week, therefore, seemed to be providential. I realized only afterwards that the achievements realized were the result of the coming together of many individual, personal discoveries I had made in recent years. For instance, several years ago I had made a telescoping box camera from black foamcore, and proceeded to see what would happen if I unscrewed one of the front objective lenses from my 7x50 binoculars and attached it to the front of the box. Stopped down to around f/50, I was surprised that this humble lens would easily cover a 5"x8" format. That was one data point. 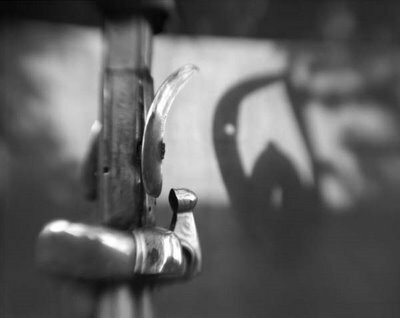 Another data point was the result of work I have done with orthochromatic paper media, specifically using a precalibrated pre-exposure to elevate the density of shadow detail and overcome a bit of photographic 'inertia' in the slow emulsion's response to dim light. In combination with using a paper emulsion of fixed contrast grade, these techniques provide for a light sensitive system more in tune with the kind of high-contrast scenes that I'm apt to be exposed to, here in the high desert of the southwest US. I became hopeful, therefore, that putting a binocular lens onto the front of the Anny Speed Graphic, and loading sheet film holders with 'preflashed' paper negatives, would provide me with an opportunity to witness a coming together of these building blocks into a new, synergistic union. What I experienced was nothing less than pure photographic joy. First, I chose to visit the Old Town section of Albuquerque for a test run of the new system. This, the oldest part of the city, was founded 300 years ago, and provides ample opportunity for photographic image-seekers of any ilk. My new system has some unique limitations that warranted exploring. For one, I had to rely on the curtain shutter to time the exposures, since the binocular lens is sans shutter. Second, I had an intuition that this lens should first be used wide-open, to explore the possibilities of narrow depth of focus images, something that I've recently been interested in exploring, perhaps as a counter to the years of working with an almost infinite depth of focus with pinhole lenses. Third, I know that I would be limited to using the outfit while anchored to my hefty Bogen tripod. What surprised me was how easy it was to preview the image projected onto the groundglass viewscreen. Wide open, the binocular lens operates at f/3, providing adequate light input for this old screen. Another surprise was my ability to exactly preview the depth of focus that would be recorded onto paper, since my previewing lens aperture would be the same as the taking aperture. What I was not prepared for was how well the images turned out. The extremely narrow depth of focus tends to isolate the visual field into a narrow zone of sharp definition, where subtle textures and details are recorded with an exacting precision. Surrounding this is a continually softening effect that proceeds outward from the central plane of sharp focus in a manner that soon renders fore and background details at first indistinct, then transformed into totally abstract fields of soft tones. These peripheral areas are no longer distinct as indicative of photographic reality; rather, they become total abstraction, lending the reality of the middle ground a framing aura that buffers the harsh reality of the image's edge. I have also come to appreciate this visual effect less as a gimmick and more as a visual metaphor that references the way in which human vision seems to proceed from extreme detail in the middle ground to indistinct zones of softness in the periphery. What most satisfies me is that these wonderful images were created in direct opposition to the highly engineered approach taken by many LF practitioners. Everything about this project is a reproach to such sophisticates: a beat-up old WWII-era box camera, an antiquated curtain shutter mechanism, a binocular lens off of a thrift-store quality binocular, and paper negatives of the type used by children in their first pinhole camera.